« Prev. Page: Kennedy "Home Page"
"First mentioned in 1200 as 'Brendescoles' thought to mean 'the burnt huts' from the Middle English word 'brende' and the Old Scandinavian word 'skali'. Brinscall was a small farming community owned by the de Hoghton family, who were lords of the manor in the 16th century. When the cotton industry came to Lancashire in the 19th century, a thriving community of handloom weavers was built up in the valley area. William Christopher Wood built the present Brinscall Hall in 1876, and a calico printworks which employed a number of people but which closed in 1928. The ruins of many of these buildings are now surrounded by woodland known as Wheelton Plantation." 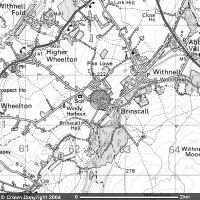 There are several tales as to why Brinscall got its name, from "Burnt Huts" to a legend of a husband to be called Bryn, his wife never returned after a trip across the moorland during heavy snow. Bryn would go out onto the moors and villages would hear him call for her "Bryn's Call"
The village was originally a small farming community owned by the De Hoghton family who still live in Hoghton Tower (where the loin of beef was knighted to give us 'Sir Loin') a few miles away. When the cotton industry came to Lancashire in the 19th century, a thriving community of handloom weavers was built up. In such a relatively small area there were so many mills. 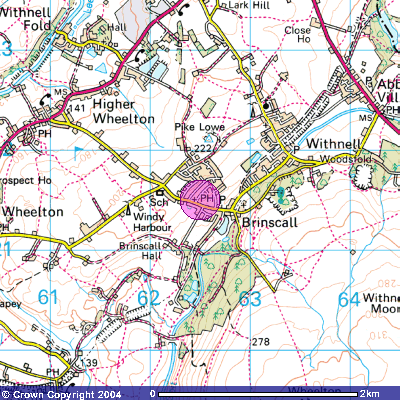 Visit the web-sites for more information, and photographs of Brinscall. During the Industrial Revolution "Marriage and Pinnock Ltd." built a Cotton-Mill in Brinscall, in Lancashire. Here, the bales of cotton were spun and woven. Later a bleaching works was built downstream of the cotton-mill, and later still, a printing and dying works was added. This meant that the whole process, from raw materials to cotton goods was now being done in Brinscall. As manpower was needed for the factories, and there were not enough people in the area, the mill-owners had accommodation built and then "imported" workers. They preferred to recruit whole families, preferably with a lot of children, who could then all work in the mills. "Reading" the census data, we can see that a family would work in the mills for several generations. After the First World War, as the factories began to close down, people would be more likely to leave the Valley and find jobs elsewhere, not connected with mills and cotton.